The style and filming and visceral energy are fantastic. The plot itself is just okay. A movie that is filled with visceral energy and momentum, this one is about a getaway driver who is Mr. Cool, and doesn’t seem to let anything phase him. Then he meets the woman of his dreams, and suddenly has something to live for, and his whole world gets shaken upside down. It just happens to be at the same time that he plans on getting out from under with the crime boss he does jobs for, and let’s just say that crime boss isn’t so eager to let him go. What we get is a somewhat business as usual plot, but some really amazing choreography, music, and style. Like the best filmmakers working today, Edgar Wright has his own unique vision, and this movie, (like every other one he has made so far,) does not disappoint. The car chases are fantastic. The humor and characters are pretty great too. The story may not be exceptional, but with everything else this movie has going for it, the film more than makes up for a usual kind off story, in a ton of other ways. Baby Driver is the newest and latest Edgar Wright movie. Like Matthew Vaughn, Wright is one of the hottest names in Hollywood when it comes to directing, not because he’s the newest director on the block, but because every movie he’s made has been terrific, and he’s got enough movies under his belt to show that what he has going is no fluke. This is the guy who directed the Cornetto Trilogy, (Shawn of the Dead, Hot Fuzz, and The World’s End.) He also made Scott Pilgrim Vs The World. And that’s it. Four movies, and he’s four for four. 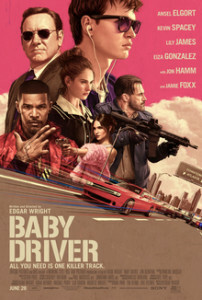 With Baby Driver, he makes it five for five. 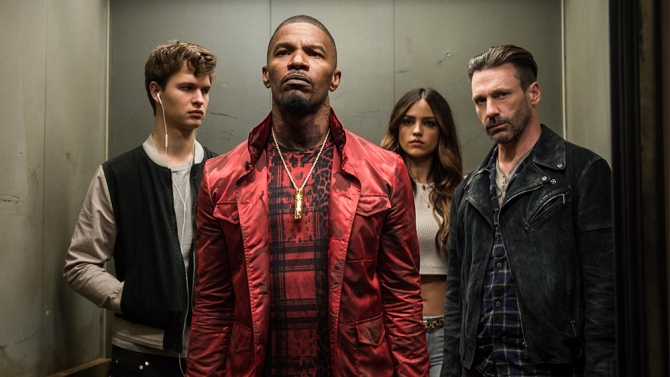 For Wright, Baby Driver is his most serious movie. Now it’s still loaded with comedic elements, and fast moving, visceral energy, as well as some fantastic music throughout the entire film. But all four of Wright’s other movies were comedies first and everything else second. In fact, this is a director who has jumped around in genre with every one of his films. From a zombie movie to a buddy cop movie to an alien invasion movie to a video game movie, he’s made it a point to never repeat himself. If that’s the case, then Baby Driver is his straight up crime or heist movie. The storyline here is actually the weakest part of the film. Not that it’s bad, but just that everything else is working on an overdrive level, and the story is just okay. It’s about a getaway driver who is doing jobs for a boss until he pays the boss back. He doesn’t like his boss or the men he works with to pull off the jobs, but he feels like he’s obligated to finish what he started and pay the boss off once and for all. Baby, (Ansel Elgort,) as the main character is named, also goes to a diner and falls in love with the waitress. They both have dreams of driving off into the sunset and leaving everything behind them, and he plans to do this with her one day. That’s about the extent of the story. It isn’t much to work with. Considering how basic it is, what’s amazing is how well this movie turned out. That’s because of a whole host of factors, starting with director Edgar Wright. This guy is super talented in all things, including action, humor, pacing, and music. He gets to put them all to good use here. He also has a pretty stellar cast working with him. Aside from Elgort, there’s Kevin Spacey as Doc, the boss and Jamie Foxx (Bats,) and John Hamm (Buddy,) as the thugs. Spacey and Foxx in particular steal the show. They are both pretty sensational. Foxx delivers one liner quips at a rapid pace that is often hilarious. And Spacey is pitch perfect as the ultra serious boss and sometimes villain. John Hamm and the female stars (one on the heist team, and then another who is the waitress that Baby falls for,) are just okay. Like the story, they are fine, but just nothing compared to the other actors who are hitting it out of the park. The best filmmakers of today’s generation have a real sense of creative music choices, from Quentin Tarantino to Paul Thomas Anderson to Wes Anderson. They always seem to know songs that nobody else knows, and that they can introduce movie goers to for the very first time. And the songs fit their films perfectly. Edgar Wright is right up there on that list with the others, and this is the movie that proves it. They say things like “the music is a character in the film,” and while that expression is pretty dopey, if it were ever true, it would be about this movie, where music actually factors into the plot. Baby has a hearing problem from a car accident he was in when he was a little boy. He has a constant ringing in his ears and listens to music to drum that ringing out. He has odd song choices, but he knows each of the songs like the back of his hand, and lip synchs as well as moves to their the songs and to their beats. Wright as a filmmaker has a specialty when it comes to stringing flashes of moments together as a rapid fire montage, the same way that Guy Ritchie does. Darren Aronofsky has also tried his hand at this, (it is all over Requiem For A Dream.) Wright has done this repeated montage of quick cuts thing in a number of his films, but in this movie it is just one of a handful of camera tricks he uses. This movie is all about the intensity. It’s about car chases, and we get three great ones. The first heist involves Buddy, his girlfriend, and a team that does a bank robbery. We watch as Baby sits in the car outside of the robbery, and we never set foot inside the bank as the robbery takes place. This is kind of funny, that we are outside, missing all of the action, watching as Baby moves to the beat of his song, while in the drivers seat of the car. Then we get a fantastic car chase. But the music and the moves aren’t all relegated to car chases. As soon as the heist is done and the money has been distributed, Baby goes off on his own and dances through the streets. He does certain movements and gestures against billboards and benches, and it’s very quick and quirky, almost like something out of Singing in the Rain. This is mean to be like silent movie level choreography, like Charlie Chaplin or Buster Keaton kind of stuff. But the movie has even more to offer. Aside from car chases and brief dance numbers in the streets, there are also foot chases, and those might actually be the best of all. Wright employs tracking shots for both the dance scenes and the foot chases, and they tear through the streets, after our hero as he moves like lightning, with zero hesitation. Baby might not always make the right moves, and he does bump into people at times, and slam his car into other cars at other times, but he never hesitates or second-guesses himself. The movie is good in the first half, but not great. We watch two quick jobs, the first with Buddy and the second with Bats. We learn about the relationship between Baby and Doc. There are some heist draw up scenes that are meant to be like Reservoir Dogs, only they don’t quite fit the bill. Maybe if Doc was detailing exactly what each team member would be doing, it would of worked a little better. By the end of the first half, we walk away feeling like the movie is fun and exciting, but nothing special. Then we get the “Tequila,” scene. This is where the characters take on a job that isn’t just a robbery or heist. At least it’s not supposed to be. The scene is both humorous and action packed, with Bats really coming to the forefront as a character with personality. He’s the live wire of the group, and Jamie Foxx plays him perfectly. From that point on, (and it’s about the halfway point,) the movie hits its stride. Suddenly the gas pedal has been pushed and there’s no going back. We go from this scene to a diner scene of the four primary players sitting down at a table having a conversation, and for the first time the witty dialogue really comes out. If the first half was all about the usual kinds of jobs, then the second half is about a monkey wrench being thrown into the mix, and all kinds of things going wrong. Suddenly we have ourselves a movie. A good film gets better as it goes on and keeps building in intensity and momentum. This movie does exactly that. In the final act of the movie, the action gets a little too over-the-top and cartoonish, as one character just won’t die, and all kinds of madness ensues. That’s okay. You want the climax to be the craziest and most over-the-top part of the movie, and that’s just what we get here. The film does go on a little too long, to give us almost like an epilogue of what happened to the characters, but maybe it’s just this movie trying to be different than all others that are similar, and would have ended a whole lot earlier. This movie might have a familiar premise, but in the hands of Edgar Wright, it gets taken in all different directions to be made to feel like its own thing. This is like a companion piece to the movie The Driver with Ryan Gosling from a few years ago. Both movies were about quiet heroes who were stunt drivers or getaway drivers or both. Both movies had the hero get caught up in something that got him threatened by dangerous and connected crime bosses. But whereas that movie was sort of dark and brooding, (despite its killer 80s tone,) this one is light-hearted and fun. It’s an excellent film. From director Edgar Wright, I would expect nothing less.